The Circuito Internazionale Napoli of Sarno went through a busy Saturday with the Qualifying Heats paving the way to Sunday’s Prefinals and Finals. Keanu Al Azhari (60 Mini), Nikita Bedrin (OKJ), Dilano Van’t Hoff (OK) and Lorenzo Camplese (KZ2) affirmed themselves as point leaders in each of the four classes at play before entering the last part of this opening weekend of the 2019 WSK Euro Series! 228,Van-thoff Dilano(NLD),Forza racing(EXPRIT/TM-RACING/BRIDG), Sarno, 24 March 2019. WSK Super Master Series, © 2019, Alexandros Vernardis / The RaceBox. Nikita Bedrin (Tony Kart/Vortex) capitalized on his fastest performance in Qualifying to accumulate four top three-finishes including one win to secure the Pole position for the Prefinal A. Conrad Laursen (FA Kart/Vortex) didn’t win this Saturday but showed impressive racecraft by recovering from a 9th qualifying time to clinch Pole position for the Prefinal B. The third overall spot was taken by Ugo Ugochukwu (FA Kart/Vortex), one win under his belt, ahead of his Ricky Flynn Motorsport teammate James Wharton (FA Kart/Vortex), who also secured a win, Robert De Haan (Energy/TM), Josep Marti Sobrepera (Tony Kart/Vortex), Norton Andreasson (KR/IAME), Christian Ho (FA Kart/Vortex), Andrea Kimi Antonelli (KR/IAME) and Alex Dunne (Tony Kart/Vortex), winner of three Heats before a difficult result pushed him down the order. Other Heat winners were Tymoteusz Kucharczyk (Parolin/TM, 11th) and Laurens van Hoepen (FA Kart/Vortex, 16th). Click here for the full OKJ provisional classification. Seven drivers enjoyed the victory in the 60 Mini. Among them, the Pole position of the Prefinal A went to Keanu Al Azhari (Parolin/TM) who claimed two wins while Jamaica’s Alex Powell (Energy/TM) won one race and will start next to him. The Belgian Douwe Dedecker (Parolin/TM) took Pole position for the Prefinal B thanks to several second places. Kirill Kutskov (Energy/TM) will complete the front row thanks to one win. William Macintyre (Parolin/TM) and Andrea Filaferro (Tony Kart/TM) won two heats each while Joel Bergström (Parolin/TM) and Maksimilian Popov (Parolin/TM) also secured one victory respectively. Click here for the full 60 Mini provisional classification. 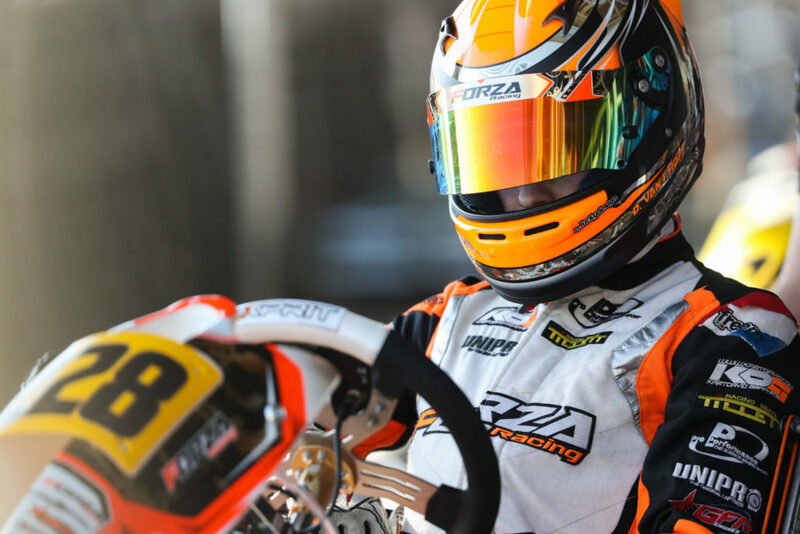 Lorenzo Camplese (Tony Kart/Vortex) kept his hand on the KZ2 class by topping the provisional ranking. From Pole position, the Italian secured a fourth place and two wins, one more than his closest rival Anthony Abbasse (Sodikart/TM) who will, therefore, start at the forefront of the Prefinal B. Third in the ranking with one win, Alex Irlando (BirelART/TM) will share the Prefinal A’s front row with Camplese while Matteo Vigano (Tony Kart/Vortex) will put his kart alongside Abbasse in the second race decisive for the Final’s starting order. Riccardo Longhi (BirelART/TM) closed up the top 5 before his countryman Marco Ardigo’ (Tony Kart/Vortex), Marijn Kremers (BirelART/TM), Adrien Renaudin (Sodikart/TM), Jorrit Pex (KR/TM), who claimed one race, and Jeremy Iglesias (Formula K/IAME). Click here for the full KZ2 provisional classification. The opening round of the WSK Euro Series will be concluded this Sunday with the Prefinals and Finals for each of the four classes. As for every event in the WSK calendar, The RaceBox provides you with a special page available on this website with Live Timing and Live Streaming (by WSK Promotion, Sunday only) along with our complete reports published every day.